Earlier this year I had a series of medical tests run, including a DNA test. My doctor found that I had a genetic defect in the MTHFR gene that means I can’t activate the folate (B-9) I get from food. I was surprised to find out that it’s not that uncommon. 20-30% of people with European ancestors have this defect. My doctor showed me a very helpful diagram (I wish I had a copy of that to share with you.) that indicates that folate is necessary for DNA creation, liver detoxification, hormone function, repairing leaky gut and the blood-brain barrier, and so many other things. big problem with a cheap and easy fix! So it’s not surprising that the list of conditions related to this defect is incredibly long. Many cancers and mental illnesses are listed as well as digestive disorders, birth defects, and heart conditions. I shared this list with my mother and we were able to trace back many illnesses within the family going back several generations due to this defective gene. The solution is a simple and cheap vitamin supplement. I take methyl folate every day now and it’s made a huge difference. (Methyl folate is the activated form of folate.) My sleep and energy levels are better—no more daily couch-naps or brain fog! Basically, a lot of issues I blamed on my food allergies have been addressed by taking this supplement. This is a life changer people—big problem with a cheap and easy fix! It’s recommended that you start slowly as you may experience some detox side effects as your liver responds to the folate. I’m still ramping up. 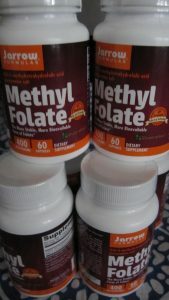 I’ve been taking methyl folate for about 2 months now. It took me a little while to find one without corn additives. Ugh! I’m still looking for a B12 supplement I can take. For more information about MTHFR, check out this comprehensive resource. This entry was posted in Autré Chose, Tips and tagged corn free, healthy living, methyl folate, mthfr. Bookmark the permalink.